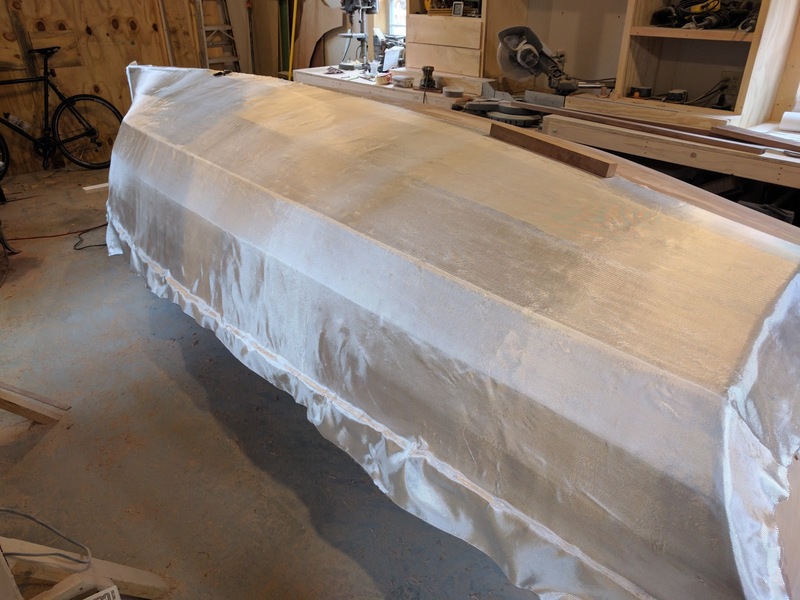 The process of sheathing, or any large lamination with cloth is not a difficult one, but you have to plan ahead or you'll find yourself making a huge mess of things. Having done some pretty large layups in the past, I've learned a few things the hard way and I was determined to not repeat those mistakes again. The first lesson that I've learned is something that I found out while laying up the decks on the Alberg 35 and has nothing to do with process or technique; it's the climate. When I re-cored the decks of the Alberg, I pulled out the old decks and rebuilt them up with a balsa core, followed by three layers of 1708 biaxial cloth. Each layer is much thicker than the single 6 oz woven cloth that goes on the Apple, but the same principal applies: When you lay up a section, make sure you have steady or falling temps or you run the risk of getting bubbles trapped underneath the cloth. Back in 2011, when I did the first section on the Alberg, I started early in the morning and I was pretty proud of myself when I finished. I cleaned up and left it for the day. I checked in on it that night and was horrified to find a bunch of small bubbles underneath the cloth, and by the time I found them, it was too late. Luckily the area was fairly small and I was able to grind out and fill all the bubbles before continuing, but I called the epoxy distributor (System 3 at the time) and the first thing he asked me was if I did it in the morning before temps warmed up. I had. I don't know what the chemical process is that causes this, but from then on I made sure to do laminations later in the afternoon when the temps were falling. In the new shop, I have a few heaters where I repeat this. I make sure it is nice and warm when I start and then turn off all heating once I start. This ensures falling temps and no bubbles. The other lessons learned are simply a matter of getting everything ready before you add the hardener. Make sure the cloth is in place and smoothed out, dispense each batch of resin up front before adding in the hardener. I measured out 3 eight oz batches of resin (it turned out to be a good guess). Then I double checked that my spreaders and brushes were ready and there was nothing in my way. Then I mixed in the 4 oz of hardener into the first batch, mixed it up well and then went to work. The 6 oz cloth is nice in that it lays down better and conforms to curves better than heavier weight cloths, but if you just randomly apply epoxy, it will deform and crumple up (making a disaster). Since I was doing one side at a time (with the center line overlapped about six inches), I started from the highest point, which is the center line and worked down carefully. 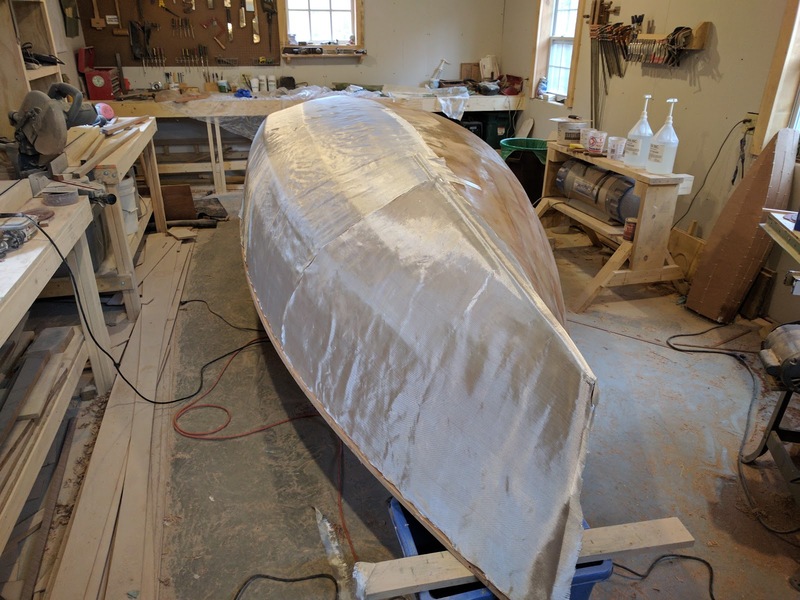 I'd pour roughly a 1.5 inch blob along a two foot section and then use the 6" plastic spreader to work it down over the keel strake and to the first two strakes. I started at the stern and worked forward and then went back to the stern and repeated for strakes three, four, and five. It all went well, but the last strake (five) was a bit tedious because it is almost vertical and you have to be careful not to use too much or the epoxy just runs down onto the outwale. 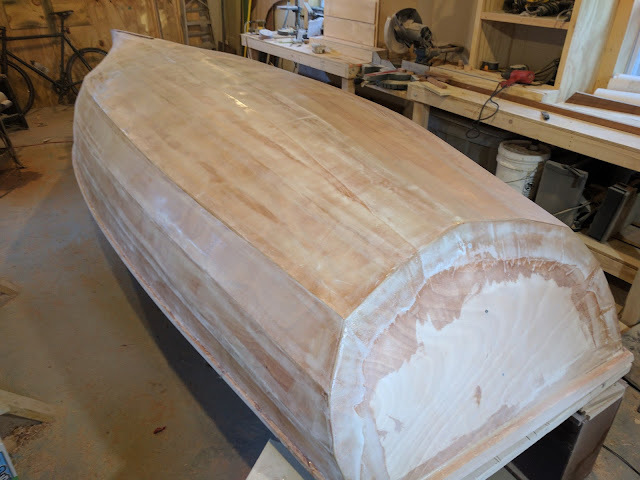 All told, it took about 2.5 hours per side and the better part of the last hour was spent working on making sure the glass on strake five was laying down properly. After I finished the first side, I cleaned up and waited until the next day for it to harden so I could do the next side. I also spent a few minutes after everything was wetted out to make sure I didn't have a bunch of pooled resin anywhere. I didn't totally succeed, but all in all it turned out well. 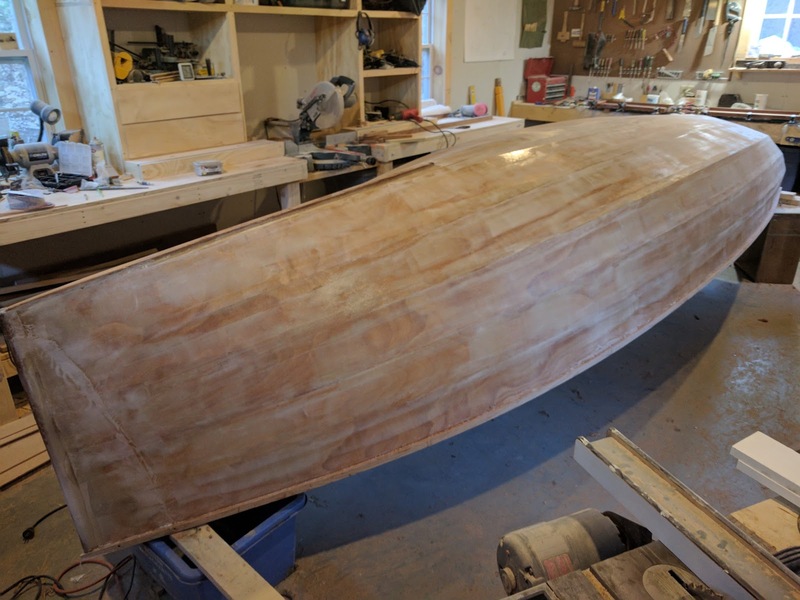 I now have a nice hard shell that I gave a quick sanding to in preparation for the next step where I will fill the weave with a slightly thickened mixture with glass fairing compound.